This is your answer to illegal immigration? Do Mexican Tourism officials understand the concept of marketing? Newsflash, to get people to come and visit … maybe you do not want to threaten them! Just a thought. 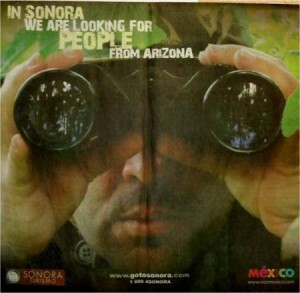 Besides the murders, drug trafficking, kidnaps and crime … would the following ad make you want to go visit Mexico, namely Sonora? Here was the heads up Tweet from Sheriff Joe Arpaio. Maybe the Lilith Fair crowd can take their Phoenix, AZ gig to Mexico. Hey Belinda, I am sure you will be safe there. By the way Belinda … heed the advice to your own songs, Our Lips are Sealed … Just shut up and sing will ya! Ive been half way around this world. I just can not understand why anyone in there right mind would want to visit a place like Mexico. There may be pretty places to visit there but you are taking your life in your hands just being there. I can think of so many great places to visit that are safe. Guess what, Mexican Tourism officials, Calderone and Mexico in general??? I’d never consider stepping foot on Mexican soil (filthy, no doubt), and I’m not from Arizona! There’s no way in hell I’d be stupid enough to put my life or anyone else’s in danger by crossing over one of the most dangerous borders on earth! Me thinks it’s the illegals who best be watching their backs, no matter where they are from! We don’t take to kindly to aliens in these here parts…lmao!! I love the ad because it says what Arizona is doing is fine and dandy !!! El presidente de taco bell give us all you got !!! We’ll just give it right back !!! Today Fox news showed a video of Obama stating…that America was winning against al Qaeda. The moment I heard Obama say that, I thought “Why won’t Obama send troops to protect Arizona’s border from foreign invaders: armed Mexican drug-cartels, drug smugglers and kidnappers that carry machine guns; invaders that increasing resemble al Qaeda terrorists?” If Obama can’t or won’t protect Arizona’s border from NARCO Terrorists, why should Americans believe Obama can stop Terrorists in other countries? #4 he’s just flapping his lips !!! I read where the gov’t is removing troops from the Mexican border to the Canadian border. The rancher that was killed in Arizona and his dog was critically wounded was out checking his water lines. He had called his brother before this happened and told him he thought someone was on his property. After investigating it was found there were footprints leading to the Mexican border. And why does Obama apologize to China because Arizona has an illegal immigration law???? He’s got some real mental issues going on and it’s getting worse. @7 Europe is not an option, we are also shipping them out as much as possible. Yeah…screw them…the thugs that run the Mexican government do not scare me. Ah…Cancun’s Mayor caught with drugs….What a top notch tourism spot in Mexico…NOT! LOL! Let’s start boycotting Mexico and see how much faster we can tank their fledging economy.